The sun was slipping down behind the trees and the birds were settling in for a long evening. It was peaceful, very peaceful... way too peaceful to be in the middle of a girl scout meeting, but as I looked around there they were - all six of them, fully focused on building spirit books. 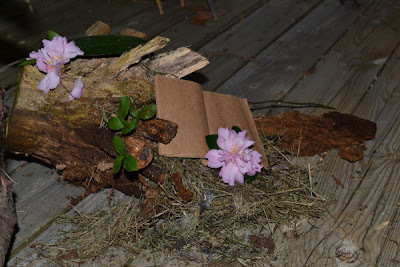 Hannah McSawley posted a description of the Girl Scouts' Spirit Book session on her blog, Muddy Girls. Thanks Hannah for your kind words.